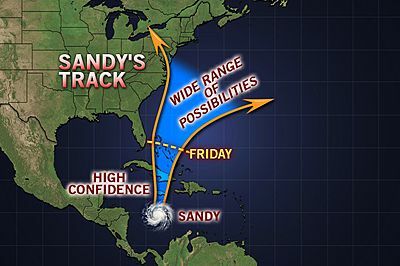 Hurricane Sandy Could Cause Billions In Damage To The North | The Voss Law Firm, P.C. The major storm with damaging consequences is still on the table from Norfolk to New York City and Boston. However, multiple components have to come together to make this perfect storm, but that is not what the insurance companies are thinking...Our sources tell us the big shots at the insurance companies are preparing for the worst....And that means, preparing for potentially Billions of dollars in lossess. People from eastern North Carolina to Maine and Nova Scotia need to keep their guard up in case the worst-case scenario occurs. The realm of possibilities continues to range from Sandy escaping out to sea, with nothing more than blustery, much cooler air sweeping in, to a dynamic storm turning inland packing coastal flooding, flooding rainfall, high winds, downed trees, power outages, travel mayhem and even Appalachian snow. 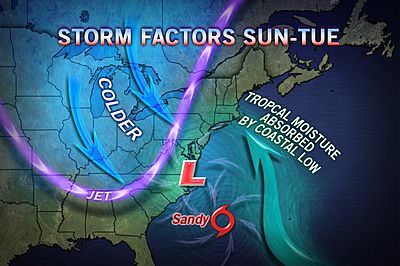 From a weather map standpoint, the worst-case scenario is for Sandy as a hurricane or hybrid storm to be captured as chilly air and strong upper-level winds join in from North America. Meteorologists refer to this as an atmospheric "bomb." Don't get caught out in the rain unprepared, take a look at some of our free articles and e-books to make sure you are prepared for the worst. For general questions, or media questions, please contact insurance policyholder attorney Bill Voss directly by clicking here.